If you want their hands to make wooden spoons, then first you have to learn to slack. The fact that in Russia this term was called scabbling axe blanks for wooden spoons. The occupation is so simple that its name has become a symbol of idleness and idle pastime. So, let's get to the blank thumbs. To saw a few churbachkov with a length of 25 cm and a diameter of 10 cm Ideal material – birch, but it'll do and any fruit tree with hard wood. Cleave the block a little in half. Obesite it gently to make a semi-circular bulge on one side and a tapering handle. This rough image of a spoon is baklushi. Cook thumbs was taken in the autumn, and long winter evenings of them have already effortlessly made beautiful spoons. With a knife trim the form so that it became graceful and gained smooth lines. When working with a knife try to send traffic from itself. The hole in the spoon is make with semi-circular chisel. Choose wood from the edge to the center. Remember about safety. In case of accidental dropping of the workpiece, the chisel should go in the direction, not you. Periodically hold the spoon to his mouth, to see how comfortable it is. Cut the blank in those places where it is needed. Too deep cutting is not necessary. If backlash was previously well dried, then made the spoon you can Polish with sandpaper. But fresh wood is much easier to cut. 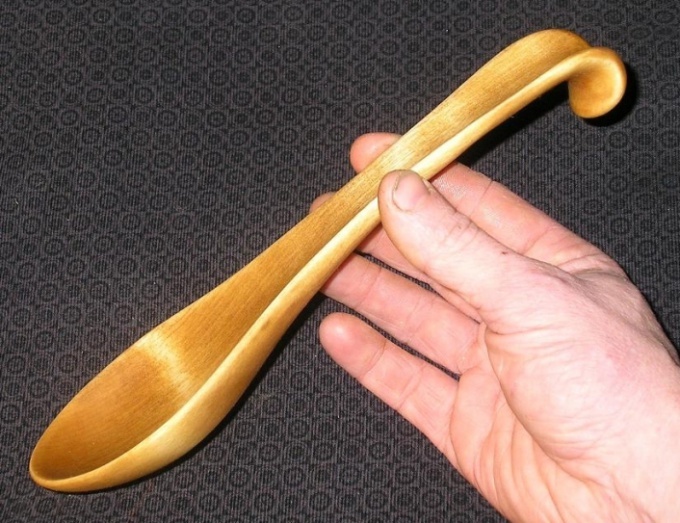 Final processing of the spoon involves the impregnation of linseed oil or linseed oil. It is recommended to do after the final drying of wood. If you are confident in your artistic taste, you can also paint ready-made wooden spoon that will give it a completely finished look. Wooden spoon. Wooden spoon is not only convenient and usual Cutlery, but also a stylish accessory. In addition, it is a true symbol of Russia. Carved out for an environmentally friendly array of Linden wood, reliable and durable, wooden spoons embody the indomitable and thorough Russian spirit. However, this is not all the advantages of wood products. Painted wooden spoons can be used as a superb musical instrument. It could be a spoon for pickles, dessert spoon, skimmer, spoon mustard, salt, etc. the Spoon is decorated with exquisite carvings, sometimes so skillful that you have to look at in the magnifying glass of its individual parts.